Neal came with me, grimacing across the bed through the last of the moonlight being cast through our bedroom window when the alarm went off at 4 a.m. Fueled by a pot of coffee, we flew up the coast to the Santa Barbara Harbor, stepping onto John’s 45-foot boat just after 6, the pale grey dawn pushing through the mists settled over the calm ocean. As we pulled out of the harbor, I asked if there was anything I could do to help. My offer was met by silence. As the boat rocked across the waves to the first crab trap I had to bury my urge to give into the building seasickness. I was on assignment. I couldn’t spend the day looking over the side. I braced myself, snapping pictures of our two-man crew preparing for the day’s work. Unfortunately, Neal wasn’t so fortunate. He spent the entire morning running between the makeshift bed in the cabin where he splayed out, noise canceling headphones on his head, trying to keep the world steady, and the side of the boat, Roxy licking his hand sweetly. Around noon, up near the Gaviota pier, John offered to drop Neal off. 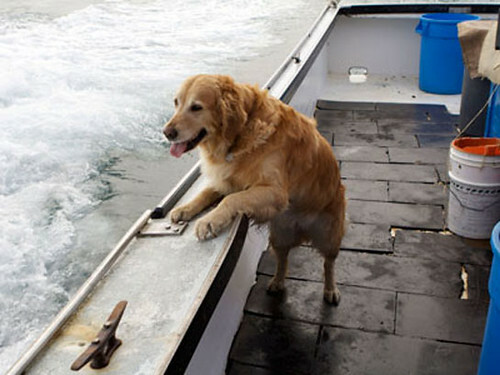 All he had to do was jump about two and a half feet from the boat to a rope, avoid a couple of baby seals, and climb to land. He did it willingly, smiling for the first time all day as he waved goodbye from the steadiness of the old pier. In the meantime, John and Paul hooked buoys along an invisible line, looping them around an industrial-sized reel that assisted in pulling 150 to 200 pounds of vinyl-coated steel and crab to the surface. The duo moved swiftly and efficiently, John sorting through the crab, tossing pregnant females and specimens whose shells were too soft (crab are molting this time of year) with a pitcher’s arm back into the drink. 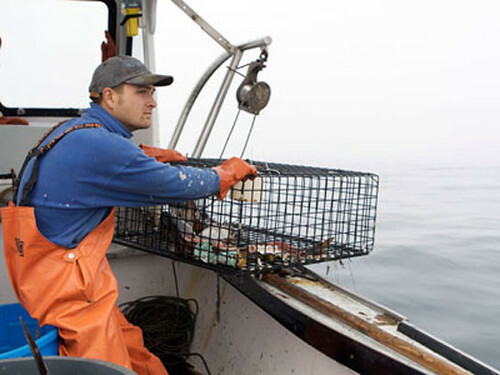 As the last crabs landed in a bucket, Paul placed a container stuffed with chopped mackerel and a halibut carcass back into the trap. When John found the spot he wanted to drop it back, they heaved it over the side, the orange buoys skimming the rolling waves as the rest drifted slowly back to the ocean floor—150, 160, 180 feet below the surface. Between traps we talked. We talked about crabbing and lobster catching, fishing and the bureaucratic b.s. 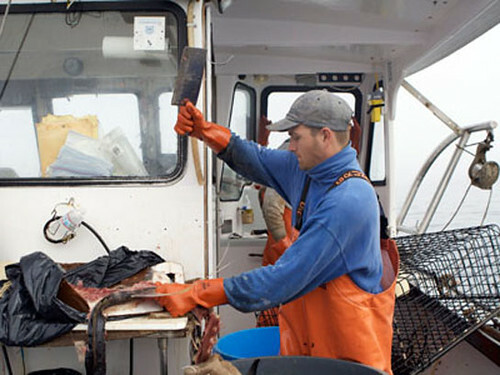 that makes a life at sea at combination of hard physical work, loneliness and politics. But to get all that you’ll have to read the EdibleLA piece this fall. Until then, here are a couple of photos of the day to whet your palate. 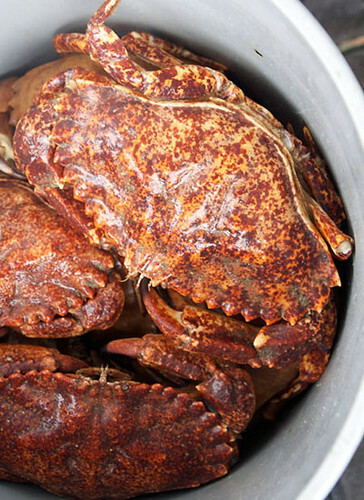 Note: You can pick up gorgeous Red Rock crab like these, as well as Santa Barbara Yellow Rock crab, line-caught halibut and red snapper from John Wilson at the Hollywood Farmers’ Market on Sundays. John will also have Spiny Lobsters this fall. Very cool post! I absolutely love seafood but I think crab is my favorite! So much work to catch these things, open them up and for a few moments of yummy bliss. It’s crazy but so worth it! Well that just made me want to buy a pair of galoshes and a box of Dramamine! What a great story, Leah. Incredible writing and awesome photos. That rented lens might have to become a keeper. Great work. I can’t wait to read this story in Edible Los Angeles’ Fall issue! Oh i prob would have been right there with Neal. I get sooo seasick! Oh man… I’m having flashbacks. Someone stop rocking the office!! Leah, what an amazing story – can’t wait to read the final version for the magazine – and poor Neal – yikes what you put him through for your work!?! no fishing for you on your honeymoon! I have a friend who owns a boat, and he talks of the same loneliness, same political situations that get in the way of a day out at sea. I’ve always wanted to try crabbing. I work with a program called Chef’s Diet, and like to bring people well balanced, healthy meals that are prepared fresh daily and then delivered to your door! 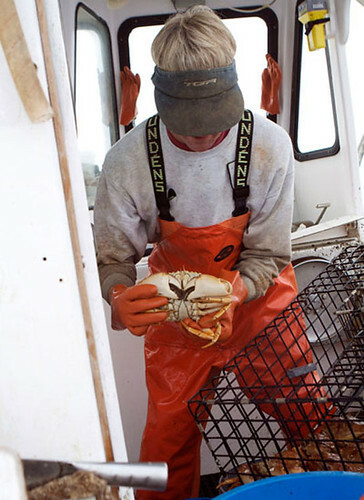 You can’t get fresher than crabbing, haha. If anyone has ever wondered if they could be eating healthy but may not have time to shop for and prepare such meals, visit us at http://www.mychefsdiet.com for more information and a chance to win a free months worth of food! Did you really just use your comment as a blatant plug for your biz? I really like seafood and especially crab so on my trip to Thailand we stayed on an island where they had a seafood BBQ. Naturally I order crab and what a mistake! They did not cook it enough and it was a jellied mass and totally uneatable. I have a feeling they did not have a clue what they were doing. I wonder if crab can be cooked on an open fire?